Today I took part in a controlled experiment on a new dietary supplement. Since Journal of Sports Science weren't interested in my results, I have instead 'published' them here. 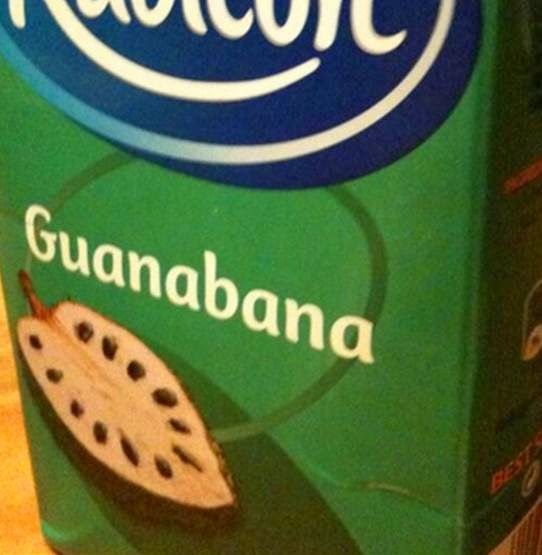 Background: No previous studies have assessed the effects of guanabana juice on endurance athletes. In fact, very few people knew about this juice drink, despite its availability in Tesco Metro, Sheffield. Results: The group that did take the guanabana juice the night before the race was about 2 and a half minutes faster. Conclusion: Guanabana has beneficial effects on the performance of athletes. Further studies are warranted during which this same subset of athletes will drink guanabana juice over longer periods of time, with the guanabana juice being paid for and delivered by the company that makes it. ***As previously noted, I have been training a lot more prior to this year's race, and turbo training on the bike, and the course was drier this year. I doubt these difference will have affected the results of the study much. P.S . Guanabana is also known as Soursop: http://en.wikipedia.org/wiki/Soursop. The company who sells it made a good choice not to call it this on the packet - I wouldn't have bought a litre of "soursop"
There are some people who run of the fells through the winter in the evenings with headtorches. I don't. But my club (Pennine) included a head-torch nighttime fell race in their club championships this year, so I thought I'd give it a go. It was called Mr Sparkles Dark Un and was 5 miles long. I've been focusing on my fitness and leg strength over the winter, but haven't done any training in the dark. I was discussing it the other day, and was told that it takes a bit of getting used to, and I should practice. But I didn't get round to it. So... the day of the race arrived - last night, and I drove up to Tockholes in Lancashire after work. It was pretty cold and predictably dark. I did a bit of running up and down the track with my head-torch on to see how weird it felt. And it did feel a bit strange. I figured it wouldn't be too hard to run uphill in the dark, as I'd be going slowly. So my race plan was to blast it for the first two-thirds of the race, which is largely uphill, then hope to cling on to my position for the final descent. I knew Dave, my club teammate, would be doing his best to claim the club champs 100 points for being first Pennine finisher, so that added a bit of extra incentive. The race went to plan - I set off quickly, and after 50 yards, thought "this is OK, I could be in with a shout here". It was quickly clear that the first two were a class apart from me, but I was in third for about half of the race. I was being followed closely by another runner who must have been Dave. His torch was bright and was helping me see where I was going, so it was both disappointing and not so disappointing when he passed me and he wasn't Dave. As he passed he said something like "better get a shift on or they'll catch up". I glanced back to see a necklace of lights streaming towards me up the hill. I replied bravely "Yep, I'm with you", as he quickly disappeared into the distance. I tried to dig deep, but was realising I'd gone off too fast (hang on - wasn't that the race plan?) and was getting that cramping stomach feeling when I'm running too tense. I was spurred on by another light behind me. This must be Dave this time, so I did my best to be brave and learn how to descend stony tracks by torchlight. If I can sum up my learning in one sentence, it's this: run as fast as you can, because the rocks that are big enough to stop you are big enough to see. I was almost feeling confident until Dave breezed past me. Thankfully, as I glanced up, I realised that this wasn't Dave either. I was still blowing, so was very pleased to be told "a few hundred metres to go". I crossed the finish line and before I had time to draw breath, Dave was there too shaking my hand. 100 club champs points in the bag (just), and my first head-torch run - and race. I'd thoroughly recommend it. I normally don't train through the winter, but I'm "ticking over" this year on two fronts. The first is running at lunch from work, which is always a good way to clear my head and get some daylight. The second is my new gym. 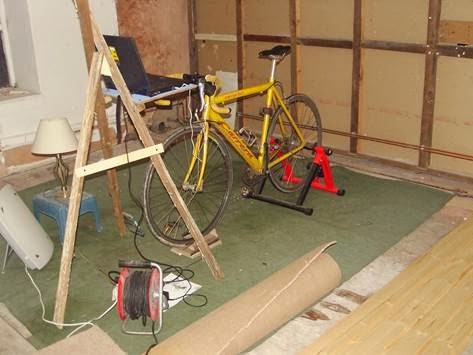 As you'll see this is a state-of-the-art facility complete with entertainment (Mrs Noel's old laptop) to watch DVDs on. I'm particularly pleased with the rustic appearance of the laptop stand. So far, I've been watching "The Wire", a US cop drama. The rule is I'm only allowed to watch it while cycling at 90 pedal strokes per minute. I started on one gear which was a bit of a challenge, and could only just do 45 minutes. After a few more sessions, I was up to the full hour's worth of an episode. I've just finished the first season (13 hours of it) and have recently moved up a gear so am back to only being able to do 50 minutes. I hope this helps my fell running. It's my first race in a few weeks. I'll let you know. I was out cycling yesterday near Macclesfield Forest. It was the first time I'd been out cycling for about three months, so it was nice to be out. It was with a friend who is visiting for the weekend, and I was showing him the fantastic views across the Cheshire plain. The conversation went something like: "Look, you can see the cooling towers on the Mersey, and if you look slightly north, you can see BLEEAAAAUUUU! PLAAAH, SPPPAAHH" as we cycled past a muckspreader and he coated us and our faces and open mouths with manure. We has seen him coming and thought it was fine, because he was spraying in the other direction. However, the wind (across the Cheshire plain) was picking up all the small particles and throwing them across the road. Lesson learned! Don't talk as you cycle past a muckspreader. Normally, I don't race in the winter. Instead taking time to put on weight and look after myself during the dark nights and short days. I tell people it's my cheese-eating season. I'm feeling OK this year, so have kept ticking over and doing the odd race. Today was Famous Grouse - a pleasantly low-key race of about 5 miles. I last ran this 7 years ago, and had no great expectations. Unlike my normal race routine, I had a few drinks the night before, didn't train much in few weeks running up to it, and didn't eat beetroot before the race (BBC story). I had told myself that I was taking it easy. This is all well and good, but as soon as I started running, my normal competitive edge kicked in. I was also practising my new downhill technique of tipping my head slight back. It seems to help my balance somehow, and ensured I kept up on the downhill sections. The upshot of this was that I was about 3 minutes faster than last time, and finished in 6th place, which I was very pleased with. However, I'm now very tired. I've had to tell Mrs Noel I'm too tired to put up the next cupboard in the kitchen, and am having trouble stringing sentences together. Mrs Noel is made of sterner stuff - she was 3rd lady today, but was quite happy to have a go at the cupboard when we got back. A nice big meal and a non-drinking relaxed night should really help restore me. Yes, you read the title correctly! I won a fell race. After about ten years of slowly improving and attending lots of local races that the top runners might not fancy doing. It was Disley Diamond Dash. This was the second year the race has been run. Last year was part of the Diamond Jubilee celebrations - hence the name. It was about 5 miles and did a pleasant loop of Lyme Park. I know what you're thinking. You're thinking, "it must have been attended by only about ten runners". Well that's where you're wrong. There were 18 runners, and most of them had done fell races before. This probably means I'm now part of the elite crowd and will be afforded a great deal of respect at national championship races. Rob Jebb will turn to Morgan Donelly and say "watch out for that Noel - he won at Disley last week," before beating me by more than a minute per mile raced (as always). I can at least dream. I'm a keen fell runner and live with Mrs Noel and two kids in the Peak District.